Gary Ballance batting for Yorkshire against Durham at the Emirates (Picture: Frank reid). LAST year, Tim Bresnan scored a career-best 169 not out in this fixture, sharing in a county cricket record seventh-wicket stand of 366 with Jonny Bairstow. Bresnan’s contribution this time was ‘just” 63, but its value to Yorkshire could be equally significant as they seek back-to-back Championship wins at this ground. When Bresnan walked to the crease on a sunlit second morning, Yorkshire were 210-6 in reply to Durham’s 172. The champions had lost Andrew Gale and Jack Leaning from their overnight 129-4, and two more wickets shortly before lunch left them 236-8, Gary Ballance having gone from 35 at the start of the day to 78, his highest Championship score of the summer, with Andrew Hodd the other man to fall. Yorkshire’s lead was already useful, but Bresnan helped them to add a further 97 for the last two wickets with young pace bowlers Josh Shaw and Ben Coad as the visitors gained a 151-run first-innings advantage, Durham closing on 98-3 in their second innings. Bresnan, who struck 69 and 29 on his only previous Championship outing this year against Lancashire at Headingley after six weeks out with a calf injury, practically comes with the guarantee of runs these days to go with still highly dangerous and accurate seam bowling. Indeed, had it not been for Bairstow’s phenomenal return of 1,108 Championship runs last year at 92, Bresnan would surely have been Yorkshire’s player of the season. The 31-year-old hit 849 Championship runs last summer at 49.94 and took 45 wickets at 30.88, figures that emphasise his sometimes understated value to the team. Bresnan batted sensibly yesterday in the manner of a seasoned match player, occasionally unfurling an aggressive shot to ensure that the scoreboard did not stay stagnant. He reached his half-century from 106 balls with five fours, not long after Shaw had departed for a career-best 24, bowled by leg-spinner Scott Borthwick as he tried to pull a long hop that perhaps kept unexpectedly low. Bresnan and Shaw added 43 for the ninth-wicket in 20 overs, Bresnan then adding 44 for the tenth-wicket with Coad, who contributed an undefeated 17 on what is also his first-class debut. Bresnan turned down singles at times to make sure that Yorkshire reached 300 and a third batting bonus point before he was last out at 323, caught at deep mid-wicket by Jack Burnham off medium-pacer Benny McCarthy. Earlier, Yorkshire had batted with great positivity to score 70 runs in the opening hour. Ballance moved quickly to his second Championship half-century of the season, reached from 61 balls with eight fours, which included two particularly handsome off-drives off Chris Rushworth. Gale, who started the day with a single to his name, also batted nicely before suddenly falling for 28, caught at mid-wicket by Mark Stoneman off Ryan Pringle. It was an isolated misjudgment by the captain, who is still striving for his first half-century in this year’s tournament. Jack Leaning was bowled by Graham Onions, who then had Ballance caught at second slip by Borthwick. Ballance has not made a hundred since the Champion County match against the MCC in Abu Dhabi in March, but this was a bit more like it from the talented left-hander. Hodd was trapped lbw by the dangerous Rushworth, giving the Durham man his maiden five-wicket haul of the summer. When Durham replied, Stoneman made fluent progress to 28 before patting back a return catch to Bresnan. 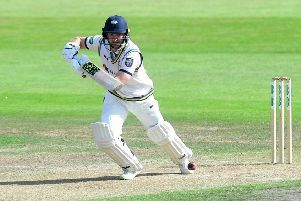 Adam Lyth struck with his fifth delivery when he bowled Borthwick with one that kept low, with the pitch showing signs of uneven bounce. It can be difficult to take wickets at Chester-le-Street in the second innings, and an inexperienced Yorkshire attack was never likely to find it so easy second time around. Bresnan and Steve Patterson are the only experienced pace men on show, with Yorkshire missing six bowlers due to a combination of injuries and international call-ups. Patterson trapped Burnham lbw playing across the line to leave Durham 83-3, adding to his first innings career-best of 6-56, which has done much to put Yorkshire in a dominant position. Keaton Jennings batted through to reach 46 at the close, facing 111 balls and striking six fours, and Michael Richardson will resume with six to his name, but there is still plenty of work for the home side to do. A Yorkshire win – with so many players absent – would be an excellent achievement and a significant boost to their title hopes. They have given themselves a great opportunity.